This weekend, I discovered an e-mail from the Codeschool in my Promotions mail box, it said: Free weekend at the Codeschool. 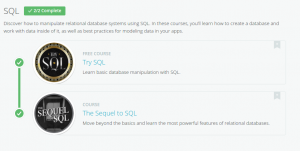 So, I decided to take this opportunity and refresh my SQL skills. I took two courses and passed them successfully. Thanks to the Codeschool.com for this opportunity. I must say, those two courses were the best I’ve ever taken so far.